i feel like i am going a bit mad lately*. last week i burst into tears at the train station, after searching for my bike for 20 minutes, because i was convinced someone had stolen it... only to remember later that i had left it at the bus stop not the train station. my house is a mess, i have a stack of books a mile high to read, essays to write, and dishes to wash. but instead of doing those things i would rather hang out at cafes, check out blogs, get excited over hair donuts, take photographs, cook new meals and snuggle on my sofa in front of a good movie. soon i'm going to start going to the gym, soon i'm going to start spending my 9 til 5s in the library... soon. 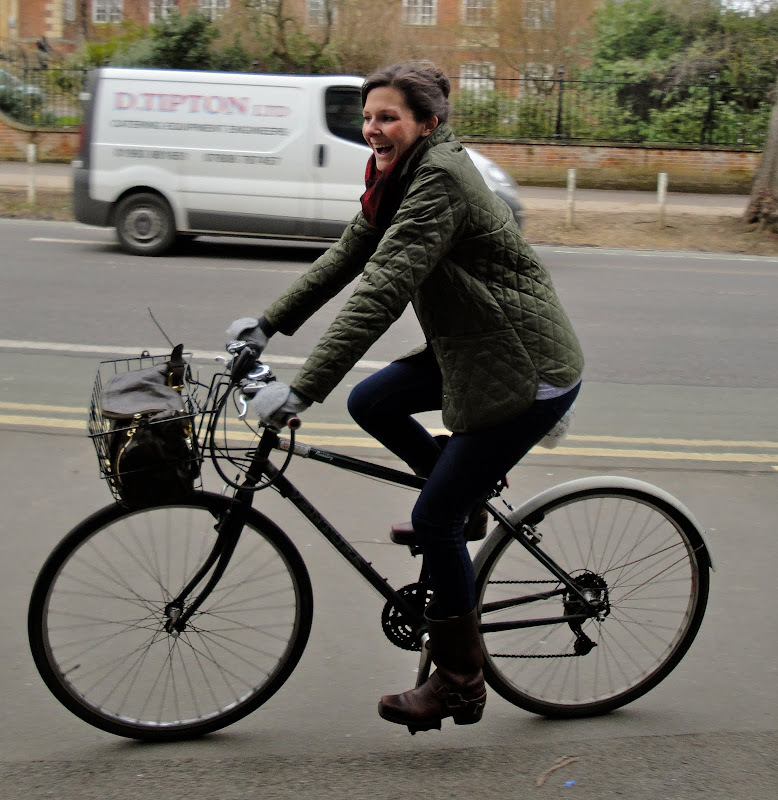 but for now i'll just show you this photo of me... in all my silly glory, riding around oxford on my bike with my fabulous hair donut in tact. i think that maybe it is just that time of year... a good spring clean is in order and some serious sunshine. does anyone else feel the same way? wearing: barbour jacket, UO pull on jeans, fry harness boots, j.crew gloves, alexander mcqueen bag, and bike - given to me as a wedding gift from a friend. *on the topic of going mad... even alice was losing it a bit, and her father told her that all the best people are a bit mad. i will rest assured in that little fact. oh, and if you haven't seen the new Alice in Wonderland you should, it is very sweet and a visual feast for the eyes.